At the beginning of the year, many writers publish lists of their favorite things from the previous twelve months. These pieces are often difficult for me — I usually have a hard time determining my favorite of anything. Whether it be my favorite color, food, restaurant, or whatever, I have a hard time committing to a definitive favorite. But I wanted to shine some light on applications that I’m really enjoying right now — an unordered list of some of my favorite apps on iOS. This is by no means a definitive list for me and I expect I’ll probably forget about some gem tucked away deep inside a folder, but these are the applications that I’ve found to be particularly delightful as of late. Bear: I switched to Bear as my notes app of choice at some point during the past year and have really enjoyed my time with it. I’ve been a longtime fan of Simplenote, but the app started to feel a little stale and there were a small number of bugs that just weren’t getting fixed. Bear’s clean design and robust features felt like the perfect replacement. GIFwrapped: I first heard of GIFwrapped when Casey Liss made mention of it on an episode of Accidental Tech Podcast. The app allows you to curate a collection of your favorite GIFs and it’s a joy to use. 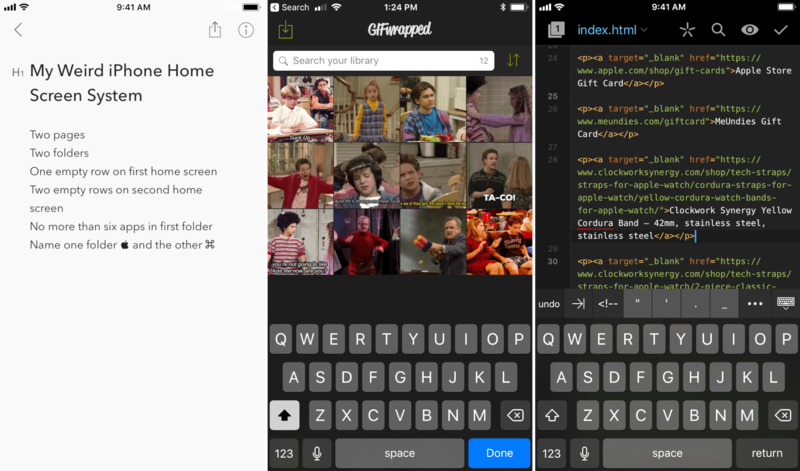 You can search for new GIFs on the web from within the app, save them to your library, and share them to your favorite social network or messaging app. The application has built-in syncing with Dropbox, so you can easily access your collection from your Mac as well. The app even includes an iMessages extension to quickly share GIFs without having to leave the conversation. Home App: I decided to jump head first into HomeKit devices this year. It started when I saw a good deal on an iDevices Switch that we ended up using to control the box fan in our bedroom. Since then I’ve purchased a second indoor iDevices Switch, an outdoor switch to control our Christmas lights, and an ecobee 3 lite. The Home app makes it so easy to control devices, setup automation, and share access with a family member that I’m certain there will be a lot more HomeKit devices in my future. Ulysses: The decreased frequency with which I’ve been publishing over the past month isn’t an indication of this, but Ulysses is still one of my favorite apps to use, by far. The brilliant team that builds the app has made major refinements over the past year to how the app looks and feels to use. It’s truly one of the most delightful apps on iOS. Scorekeeper XL: The app is intended to be used as a way to keep score during board and card games, but I actually use it for an entirely different reason. I manage a freight team at my day job and use Scorekeeper XL to keep track of how much needs to get done in all of the departments I’m in charge of. It serves as a great dashboard to see where we need to focus our energy throughout the week and helps me ensure that we’re putting out as much as what’s coming in. Next: Does Google Miss Google Reader?